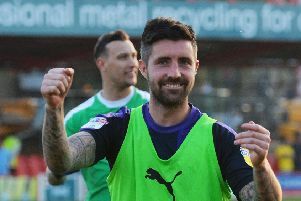 Luton went down to a 2-1 defeat against Accrington Stanley on Saturday as they were knocked off top spot for the first time since late November. Here’s how the Town players rated on the day. Marek Stech: 6.5 - No chance with McConville’s first such was the quality of the strike and hard to see if he could have done too much to prevent Key winning it late on. Jack Stacey (STAR MAN): 8 - Impressed in both attack and defence as he made one excellent intervention to prevent Kee from scoring and what an assist for Elliot Lee to make it 1-1. So close to a winner too, denied by a wonderful save from Chapman. Dan Potts: 7.5 - Such a presence in both boxes as he saw two headers cleared off the line and should have won a penalty too for handball too. Also first up to make a number of crucial clearances from inside his own area when Stanley delivered. Alan Sheehan: 7.5 - Limited the visitors to very little chances from close in, as both goals came from outside the box. Had kept the prolific Key quiet for long periods, until that stoppage time winner. Glen Rea: 7.5 - Went about his business with quiet efficiency as has become the norm, often in the right place to clear up any danger that Town were under. Distribution good, but maybe stood off Key for the briefest of moments as the striker won it. Flynn Downes: 6.5 - Didn’t have quite the same impact he has had since joining Town with a few passes cut out. Still retained that air of composure when on the ball though and kept things moving first half. Olly Lee: 7 - Got into some decent positions to cross from the right and a lovely through ball sent Stacey away only for Chapman to make the save. Could possibly have got tighter to Key in stoppage time. Luke Berry: 7 - Midfielder got through plenty of work on the left hand side as Luton pressed for long periods but didn’t quite have the sight of goal he would have liked to add to his tally. Andrew Shinnie: 7.5 - Impressed during the first half as he was getting plenty of the ball and sent one swerving effort only narrowly wide. Influence faded as the game wore on and replaced by Gambin late on. Elliot Lee: 8 - Back in the starting line-up after six weeks out and was a real livewire throughout, always looking to get efforts on target. Manufactured the shooting opportunity for his goal really well, beating his man and slotting through Chapman’s legs. Danny Hylton: 7.5 - Adds so much class to Town’s front-line with his hold up play and ability to bring others into the game. Didn’t have that many chances to end his search for a goal though, one header flashing wide. Harry Cornick (SUB): 6.5 - Added pace on the right when he came on, but couldn’t quite create that one chance Town needed. Luke Gambin (SUB): 5.5 - Can consider himself unlucky not to start and didn’t have enough time to make an impact. Jake Jervis (SUB): 5 - On for the final minute.